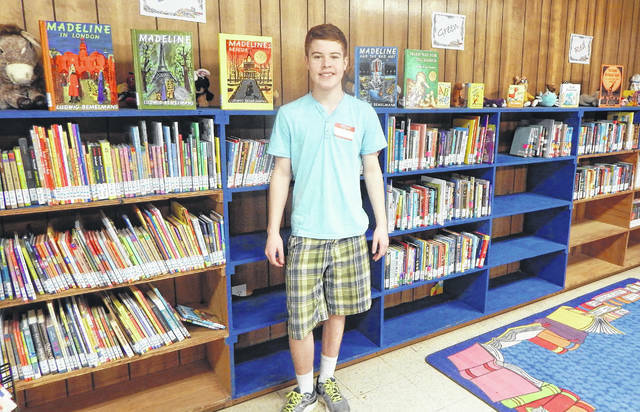 Heber Fuller, a freshman at Olentangy Orange High School who dedicated his Eagle Scout Service Project to collecting books for Hull-Daisetta Elementary School in Hull, Texas, stands in front of some of the nearly 18,000 books he helped collect and unpack at the school’s temporary school building in Hardin, Texas. The elementary lost nearly 12,000 library and classrooms books during Hurricane Harvey. What Mother Nature taketh away, Olentangy Orange High School freshman Heber Fuller — with the help of the local community — giveth back. After Hurricane Harvey decimated school buildings throughout the Texas Gulf Coast in August, leaving many students and teachers without books to read, Fuller — a member of Boy Scout Troop No. 696 in Westerville — decided to dedicate his Eagle Scout Service Project to restocking the bookshelves at Hull-Daisetta Elementary School. Located northeast of Houston, the school lost roughly 12,000 library and classroom books as a result of the hurricane. As of Nov. 16, the school now has nearly 18,000 new and gently used books thanks to Fuller’s book drive. During the month of October, the Delaware County community with support from surrounding communities, surprised Fuller with their generosity as books poured in from local schools, libraries, churches, businesses such as Half Price Books, and nonprofits like Books For Bedtime. As for getting the books 1,100-plus miles to Hull, Texas, two local businesses stepped up to lend a hand. Lowe’s donated heavy duty moving boxes and tape to ship the books, and Pitt Ohio transported the books free of charge from its Grove City hub. Fuller said the books weighed 4.3 tons and would have cost more than $1,000 to ship had Pitt Ohio not donated its services. To see his project through to completion, Fuller and his father, Chris, flew to Texas and spent several days helping to unpack the books and stock the empty bookshelves at the elementary’s temporary location in Hardin, Texas. In summing up his Eagle Scout Service Project, Fuller said it’s an experience he soon won’t forget after helping bring joy to children affected by Hurricane Harvey.